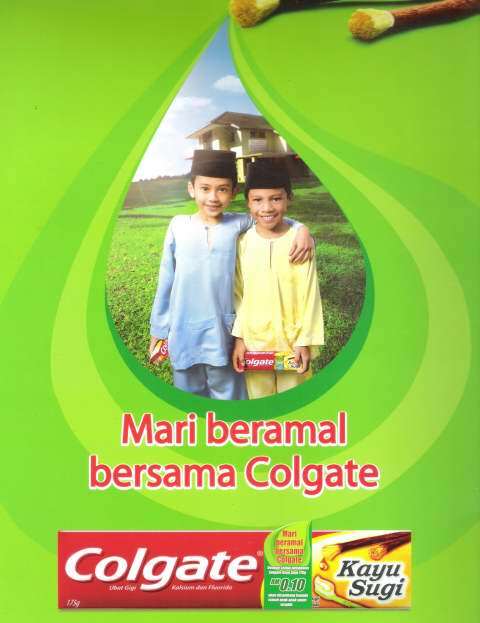 Campaign ” Mari Beramal Bersama Colgate ” were launch to benefit the orphanages from around the country. In this activity, with every Colgate Kayu Sugi 175g sticker pack purchased on or before 31st October 2008, RM0.10 will be distributed to orphanages selected by Jabatan Kebajikan Masyarakat Malaysia. The campaign starts 1st September in conjunction with Ramadhan and will close on the 31st October. It is one of the many activities undertaken by Colgate-Palmolive as a show of appreciation and support for the community, in line with its commitment to touch the lives of Malaysians not just through its products, but through its active participation within the community. As part of the Colgate Kayu Sugi “Mari Beramal Bersama Colgate” campaign launch, Colgate-Palmolive Malaysia also announced the Colgate Kayu Sugi sponsorship of Upin & Ipin, a popular award winning local animation that will be screened in September and October on TV9. The program imparts good values, subtly intertwined with the plot, so as to be easily understood by children. Entry filed under: news. Tags: Promo.